This is a project archive. All projects, attributed to their primary authors, are realized in collaboration between students, faculty, and staff at the Future Cinema Lab. A collection of abstractions that can be used to connect to Intersense tracking grids (IS 900) and work as a complement to COSM for Max/MSP by the Media Arts & Technology Program at UC Santa Barbara, USA. Objects include abstractions for communicating to individual trackers by connecting them to cosm.nav objects, working with a Video Head Mounted Display as a background image and the is900.mxo itself. 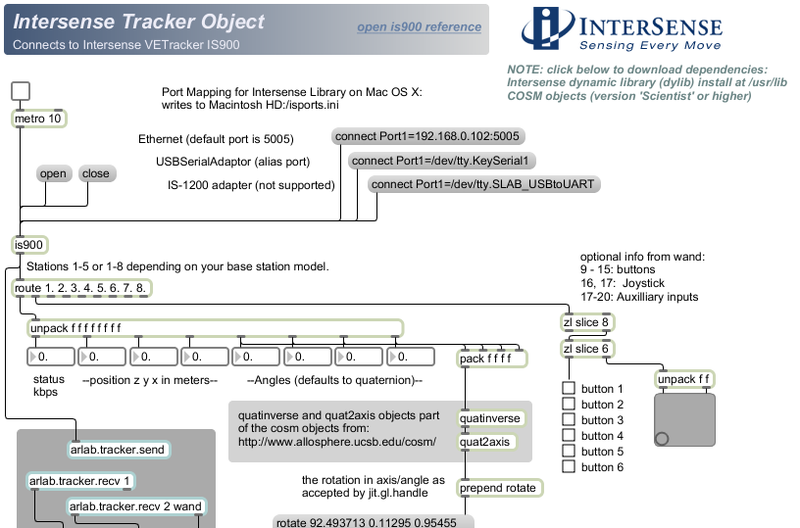 NOTE: you will have to perform an install of the COSM objects and the dynamic library from Intersense. 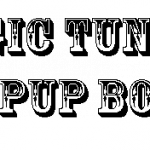 Links are included in the is900.maxhelp file. 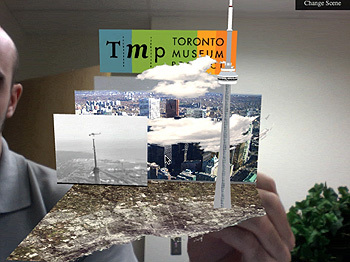 Handheld City is an online streaming experience developed by the AR Lab for the city of Toronto’s virtual museum project, which launched March 6 (Toronto’s 176th birthday). Using AR as a storytelling device, the researchers organized and animated the digital objects in the museum collection and created an interesting way to interact with the objects and access the accompanying text. You can download the code and make your own handheld city! 52 Card Psycho is an installation-based investigation into cinematic structures and interactive cinema viewership. The concept is simple: 52 cards, each printed with a unique identifier, are replaced in the subject’s view by the individual shots that make up a movie scene. The cards can be stacked, dealt, arranged in their original order or re-composed in different configurations, creating spreads of time. The technology used is marker-based augmented reality, where special printed markers are recognized in the video feed and pass data regarding their unique identifier, their position, and their orientation. The computer then feeds a display overlaying the video clips of each shot onto the appropriate card and continually mapping their position and orientation. 52 Card Cinema has been presented at ISEA in Singapore 2008, at Imagine RIT 2009, Rochester, NY, and as a Juried Exhibition, ISEA in Belfast 2009. Living Postcards is an interactive display designed for use at the Future of the Internet Conference, Prague (2009) and the Canada 3.0 Conference, Stratford (2009). 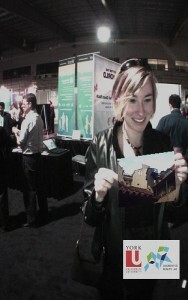 Users approach the booth and can watch a mirrored projection of themselves holding a movie clip in the palm of their hands. By holding a postcard imprinted with a black and white marker users are greeted with a variety of images and have a picture taken of their experience. With the users permission, that image is then uploaded to an online gallery. The demonstration was meant to highlight Canadian technological advancements in the fields of augmented reality, storytelling, and by extension, digital new media by offering in an engaging, handheld experience. You can view the galleries through the links below. Based on works by Raymond Queneau and Christian Bök, this architecture demonstrates the potential of an augmented performative space. The tracker uses both sonic and gyroscopic positioning data to interpret the users location in the room. 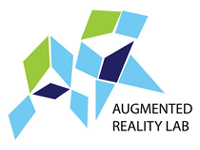 Using the Designer’s Augmented Reality Toolkit a 3D scene is created and media clips are triggered in response to the user entering each zone.